This is in short the difference between sharpening stone vs honing rod and I will further explain in finer detail. Sharpening is removing old tired steel that was the actual edge and replacing it with fresh underlying steel. When done correctly you create a refined and sharp edge. The sharpening stone is in fact an abrasive block and if you look under a microscope you will see peaks and troughs. Sharpening leaves the same finish on the edge of a blade and this looks like serrations under a microscope. When you use your knife a day and chop and cut on a board the serrations will fold over left and right. This is when you would use a honing rod to bring the serrations back in line. This will give you a feeling of a sharper blade but this action is not sharpening. After long use of a knife the edge will get dull this is when metal fatigue sets in. This is the point where a knife needs sharpening on a stone. 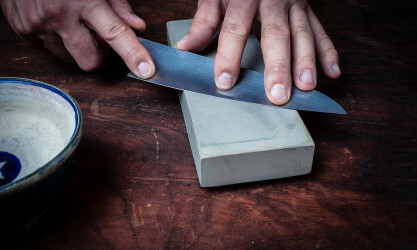 When a knife is dull sharpening is the only option and the use of a honing rod won’t have any effect. Honing on a rod is maintenance and sharpening is replacing the edge with a new one.